It’s early, 4 am. It’s going to be a good day, the darkness is a kind of blue. 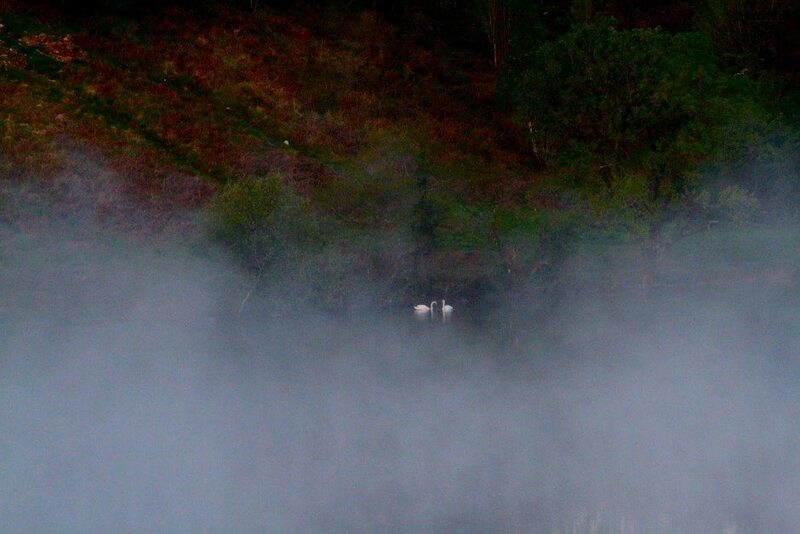 A spooky mist is rising from the lake. As the sun starts to brighten in the east it gradually takes on a warm tinge. It is very cold but the wafts of mist promise the warmth of summer. 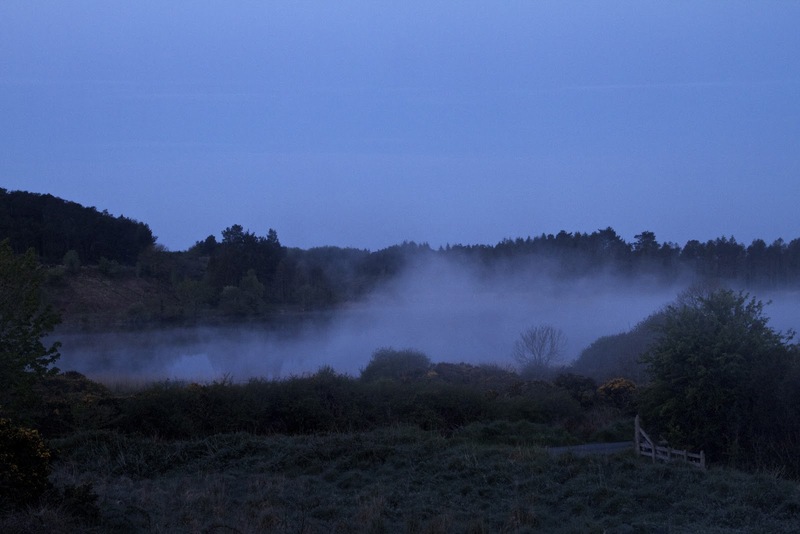 The small cauldron of the lake is steaming into life this May morning. 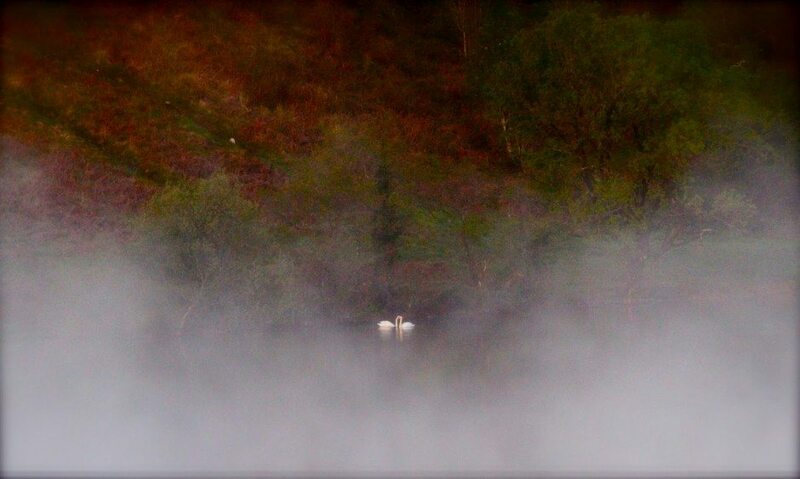 Two swans slowly make their appearance. At first they move closer together as if in an embrace and then they head in different directions, one south, one north. Out of the darkness the day fully arrives as usual and all the sleepyheads begin to emerge everywhere and greet their loved ones. Most stunning photos of your early morning dawn. Gosh, how lucky you were to see the swans gracefully come together. What great shots, love the way those swans embrace just beautiful . Wow,what wonderful photos I'm glad you were up early to capture it. The swans add an extra dimension it looks so magical. Wow…..These photos are so magical and special.It would definitely be worth getting up at 4 am to see this! You have reached some new heights here–I hope you include some of these shots in a gallery show sometime. I expect to see my knight in shining armer riding out of the mist on his horse. Beautiful photos. Twoje zdjęcia budzącego się dnia są wspaniałe, a łabędzie na tle tych obrazów wyglądają uroczo. Pozdrawiam. Your photos of the waking day are great, and the swans on the background of these pictures look lovely. Yours. swans that pass in the dawn – good title for a coffee table book of all your brilliant images. This sleepyhead appreciates your efforts! Great photos of the mist… my favorite time of the morning. It creates the illusion that we are surrounded by nothing/no one, the air is cool, perfect time to plant and weed! I love the second photo! Wonderful composition and atmosphere.